The URLs screen shows the web paths of an asset. Asset web paths are determined by the URL of the Site, where the asset sits in the hierarchy of the Site and the name of the asset when it was created. For example, a Standard Page called Matrix is created under the Squiz page in a Site. The Site URL is http://www.example.com. The web path of this page will be http://www.example.com/squiz/matrix. By default, spaces in asset names are replaced with underscores in URLs (e.g. home_page). The URLs screen is shown in the figure below. Please note that the options on this screen are similar to those on the Web Paths screen of a Standard Page in the backend. For more information, refer to the Web Paths chapter in the Asset Screens manual. This section allows you to view and change the current web path of the asset. To change the URL of the asset, enter a new path for the asset in the Web Paths field and click Save. 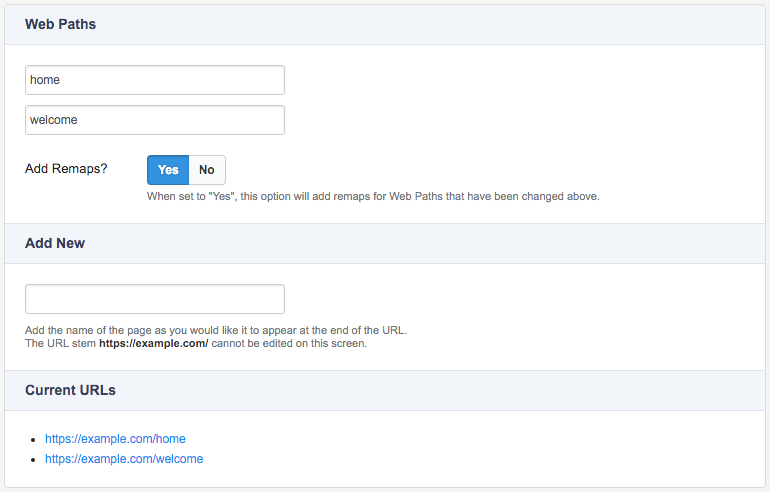 This option allows you to toggle whether to add remaps for the Asset when the Web Paths are updated. In the above example, if this option was set to yes, users that visit 'https://example.com/home' will be redirected to 'https://example.com/welcome'. This section allows you to add additional web paths to any existing web paths already configured for the asset. To add a web path, enter a web path for the asset in the Add New field and click Save. 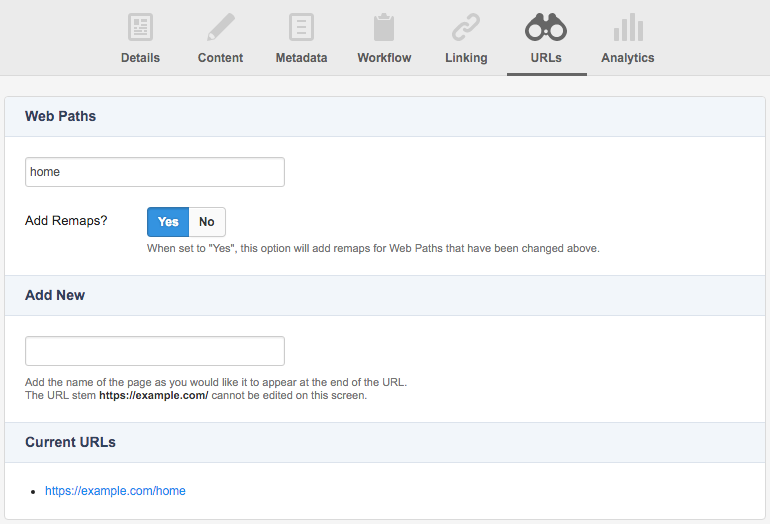 The new URL will be listed under the Web Paths section, as shown in the figure below. This would mean that a user can view this asset using both the http://www.example.com/home and http://www.example.com/welcome URLs. To delete a URL, erase the name of the web path in the Web Paths field and click Save. The URL will be deleted. Please note that assets must have at least one valid web path. If you attempt to delete the web path on an asset with only one URL, an error message will be displayed and the URL will not be deleted. This section displays the current URLs applied to the asset.